that is, in each one of us. That is a very Beautiful tribute to Our Lord, thank you and Happy Birthday to him! My Heart felt wish of our Lords gift to you on his Day of Birth and for the New Year of Great love! Thank you Miro …..Abundant peace and joy to you. Excellent and loved the picture! Thank you! Thank Debbie…isn’t the picture interesting? 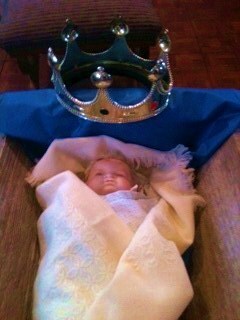 I took it and the little crown was actually sitting on the blue throw but it looks like it is floating above it. God bless you! So perfect for these last few days before we officially celebrate His birth in a stable. He IS one of us. He did come among the most humble of us. Let us rejoice as HE is born again in each heart following that Star! Yes and may we always be “hearts that are following the star”! God Bless you Granbee. thank you Noel….God bless you! May we feel every day about our Lord and Savior, Jesus Christ, as we do on the day of His birth. Merry Christmas to you and your family. Yes Wayne, may our hearts carry that Christmas joy each and every day! God Bless you! He is here! Merry Christmas! Amen Amen Amen. God BLess you Goss Coaching! Lovely. Something to reflect on today. Merry Christmas, J! Thank you jodiq….and may you be blessed with that Christmas peace all the year through. God Bless you!